This article seeks to be a clearinghouse of information and links regarding the history and state of Orthodox Christianity in the Philippines. The current Orthodox presence in the Philippines is minimal. However, early in the 20th century a small Russian parish served émigrés in Manila, the capital city of the Philippines. The presence of this Russian parish ceased to exist after the Second World War. Another Orthodox parish under the jurisdiction of the Ecumenical Patriarchate was founded in Manila during the early 1990s. 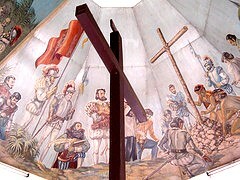 Christianity was first introduced to the Philippines in the 16th century by Spain, when the Philippines became its colony. Until the Philippine Revolution of 1896, it was illegal for any non-Roman Catholic church to establish itself in the Philippines. The Archbishop of Manila served as both representative of the Spanish Inquisition and, during the absence of the governor-general, the Spanish Crown. After fighting a bloody revolution against Spain, the Philippines then fought another war for its independence against the United States. However, the Philippines was annexed by the United States in 1898 and remained a colony until 1946. Religious tolerance was then instituted. The new American governor-generals then encouraged the spread of the Episcopal Church through government donations of land. One source suggests that the Armenians, Greeks and Mecedonians were the first Orthodox Christians on the island. An eighteenth century document written by Murillo Velarde, a Jesuit historian describing their Order’s missionary labors in the Philippines, records the presence of Armenian and Greek settlers in the Philippine capital city of Manila as early as 1618. (Blair & Robertson's The Philippine Islands 1493-1898, Cleveland, Ohio: 1906, Vol. XLIV, p. 27). An influx of Russian émigrés fleeing the Soviet regime occurred during the American colonial regime. In 1935, a Russian parish was established in Manila, and the Patriarch of Moscow and All Russia appointed Father Mikhail Yerokhin as vicar. The Episcopal Church then permitted Fr. Mikhail to use the north transept of their cathedral for worship. In 1937, the first Orthodox church was built and was named after the Iveron Icon of the Mother of God. This also became the first Orthodox altar in the Philippines. Later, both the Episcopal Cathedral and the Russian Orthodox church in Manila were destroyed by American bombing during the Second World War. 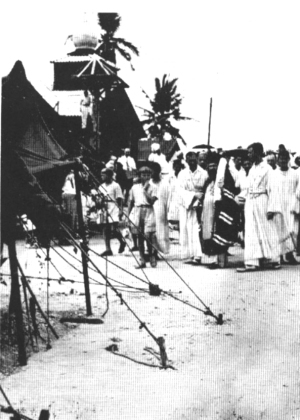 In 1949, 5,500 Russian Orthodox from China, including then-Archbishop John (Maximovitch), were relocated to a former US Army base on Tubabao, in the south central Philippines by the International Refugee Organization and with the permission of the newly independent Republic of the Philippines. Under Archbishop John's direction a wooden church, orphanage, and other buildings were established on the grounds of the base, for the Russian refugees. Tubabao, however, was (and still is) an underdeveloped island which is humid, prone to typhoons, and at times inaccessible due to the ocean conditions. When a Russian commented on their fear that a typhoon would destroy their camp to local Filipinos, they replied that there was nothing to worry about because "your holy man blesses your camp from four directions every night." There were no typhoons or floods while the Russian refugees sheltered at Tubabao. Abp. John did not preach the Orthodox faith to the Waray-speaking inhabitants of Tubabao. No Filipino was baptized, chrismated, ordained or consecrated during the refugees' stay in the Philippines. Abp. John himself was only present for a few months, until the camp was set up and running; during most of the two years the refugees were at Tubabao, he was in America, lobbying the Congress for their reception into the USA. Through his persistent lobbying, the refugees were allowed to settle in the United States and Australia beginning in 1951. Around the beginning of the twentieth century, Greek sailors settled in Legaspi city on the island of Luzon. Descendants of these Greek Orthodox Christian sailors now number no more than 10 families, who have kept their Greek surnames and many of whom have become distinguished public figures and intellectuals in the Philippines, including serving as the Greek consulate in Manila. Though they do not speak the Filipino language fluently, they were largely responsible for the re-establishment of an Orthodox presence in the Philippines through their encouragement of Filipino converts and the Hellenic Orthodox Foundation. One of the first Greek Orthodox to arrive in the Philippine province of Albay was Alexandros Athos Adamopoulos (aka Alexander A. Adamson), who came to Legaspi city in 1928. Together with his brother and cousin he co-founded Adamson University in 1932, which is now owned by the Vincentian Fathers of the Roman Catholic Church. Adamopoulos was appointed in 1942 by the Greek government to take charge of Greek interests in the Philippines. He was later promoted to the rank of Consul General of Greece. In 1989, Adamopoulos saw the need to establish the first true Greek Orthodox church in the Philippines and thus established the Hellenic Orthodox Foundation Inc. Although he died in 1993 before the church was completed, the Orthodox Cathedral was finished in 1996 and is constructed in true Byzantine style, with all the interior furnishings imported from Greece, and is home to approximately 520 Filipino Orthodox and 40 expatsin Metro Manila, the capital city of the Philippines. This cathedral was consecrated by His Holiness Ecumenical Patriarch Bartholomew on March 5, 2000. On April 20, 1990, a Filipino hieromonk, Fr. Vincentius Escarcha (a former Benedictine Abbot and a Roman Catholic priest for more than 20 years in Bajada, Cataingan, Masbate island), together with four nuns and faithful members of his community, were received into the Orthodox Church by Metropolitan Dionysios of the Greek Orthodox Metropolis of New Zealand and assisted by Bishop Sotirios of Zelon. On January 19, 1994, Metropolitan Dionysios, assisted by Bishop Sotirios, received by Holy Chrismation several Filipino Christians in Manila. In 1996, the Orthodox Metropolitanate of Hong Kong and Southeast Asia was created for the needs of the faithful under the Church of Constantinople. In 2004, the Theotokos Orthodox Church in Bajada, Masbate was consecrated by His Eminence Metropolitan Nikitas of Hong Kong and South East Asia. At present, the nuns of the Theotokos Orthodox Monastery in Bajada run a kindergarten. Within the Ecumenical Patriarchate's Orthodox Metropolitanate of Hong Kong and Southeast Asia, there are currently three Filipino Orthodox priests in the Philippines, along with four nuns, and are administratively under an ecclesiastical vicar from Greece. In these communities, the Divine Liturgy and other Orthodox worship services are said in English, Greek and Filipino. In 2007 the Antiochian Orthodox Christian Mission in the Philippines, was established under the Antiochian Orthodox Archdiocese of Australia and New Zealand. In 2008, two Filipino denominations were received into the Antiochian church, including 32 communities with some 6000 believers. These denominations - one ex-protestant, led by Fr Jeptah Aniceto, and one ex-independent, led by Fr Pascualito Monsanto - formed two vicariates, based in Davao and Manila respectively. In 2009 Jeptah Aniceto left the Antiochian Church to pursue native religious teaching in Africa, and now identifies as a Muslim. Many of his followers left the Antiochian Church; some connected with an Old Calendarist group under Bishop Kleopas (Daclan). In 2013, clergy from both ROCOR and the Moscow Patriarchate responded to requests from Filipino groups for catechism and baptism. Two dioceses of the Iglesia Filipina Independiente ("Aglipayans" entered into a period of catechism, and beginning in 2015 many parishes were received in mass baptisms. In 2017 a hieromonk was sent from Russia to reestablish the parish of the Iveron Icon of the Theotokos, destroyed in 1945. On July 17, 2017, mission clergy and leaders were commissioned by Archbishop Sergiy of Solnechnogorsk, chancellor of the Moscow Patriarchate in East and South Asia . Three priests now serve the Russian mission which now numbers approximately twenty parishes and mission communities. There are also some independent groups in the Philippines that use the term Orthodox in their names but are not in communion with or are recognized by any canonical Orthodox church. The Philippine Islands, 1493-1803 by Emma E. Blair & James A. Robertson, Volume XLIV, 1906 Online edition from the University of Michigan. This page was last edited on October 3, 2017, at 11:11. This page has been accessed 98,259 times.